It’s a well-known fact that 1970s drag racing was pretty much the coolest thing that has ever graced God’s earth. And Blind Freddy could tell you that the French are as cool as all hell. 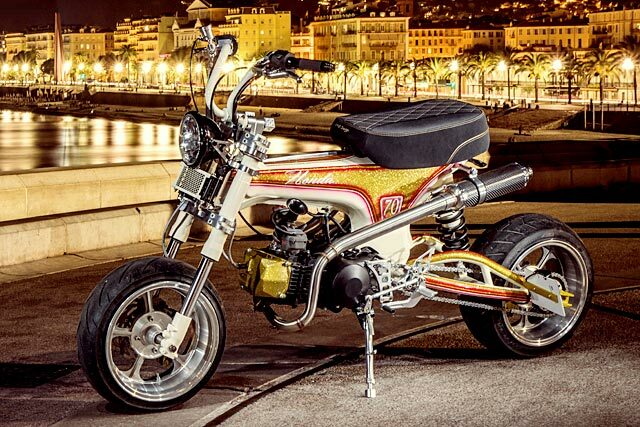 And what about the Honda Dax? That thing’s cooler than James Brown doing shots of liquid nitrogen. So what happens when you combine all three? You get coolness levels approaching that of Absolute Zero. 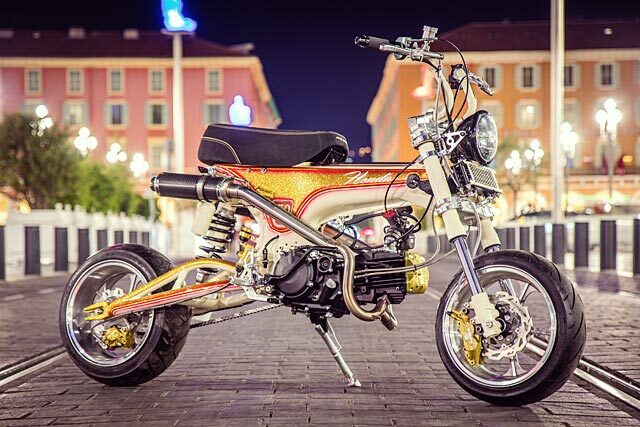 Just ask French bike builders Duke Motorcycles; after getting their hands dirty on this little Honda Dax drag bike build, they’ve probably got a case of terminal frostbite. “My name is Lionel,” says Monsieur Duke, the shop’s owner. “I’ve been a car and motorbike mechanic for over 20 years. 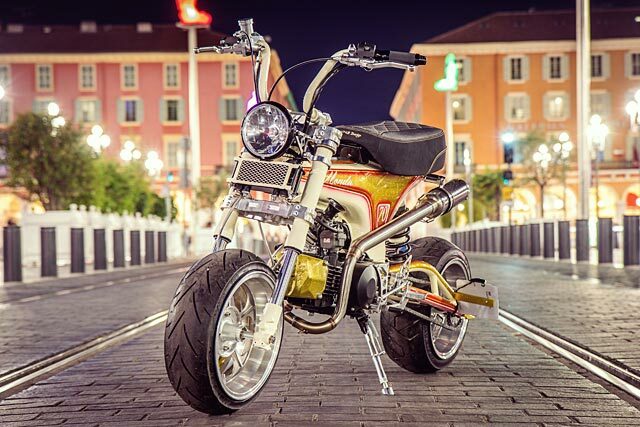 I’m passionate about all kinds of motorbikes, but particularly custom bikes. Then four years ago, I set up my workshop to pursue my passion and cater especially for cafe racers, scramblers, brats and bobbers”. 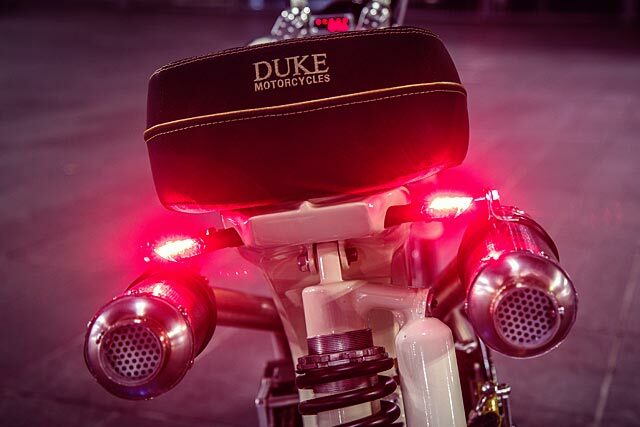 The Duke workshop is situated in Tourettes sur Loup, a small village next to Nice in the South of France. By all reports the shop itself is quite basic. As Lionel explains, “It’s to keep the spirit of the cafe racer in all of my work”. 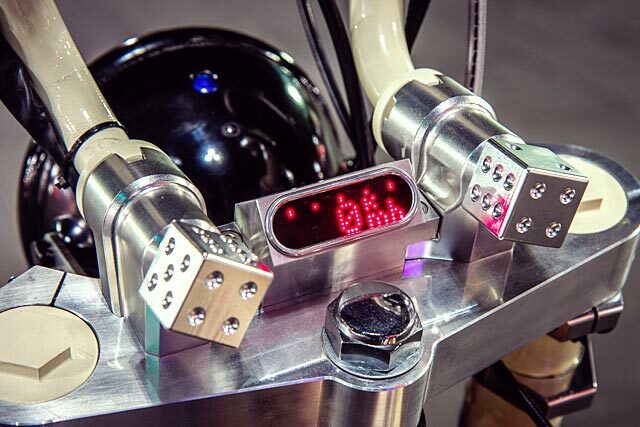 “For this project, the client wanted the Dax to keep some essence of the design’s original spirit but be much more muscular, so I decided to do it as a ’70s-style drag bike”. Sure that seems simple enough, but as we all know, drag bike need a wider tyre – and wide tyres is something the Dax was never designed for. “To get the rear end the way I wanted it, I had to completely cut it up and then rebuild everything bigger and wider”. That includes a full custom swingarm, too. And that wasn’t all that was chopped. The entirety of the bike’s frame was made wider to accommodate a bigger, better 5.5 litre tank and the fresh 190cc, 30 hp Daytona 4-valve donk designed for competitive dirt bike racing. Fun fact: that’s a 600% increase on the factory bike’s original 5 hp. Hot diggity. “With such an increase, it was necessary to upgrade the brakes. We decided to adapt some Ducati Brembos and made all the required fixtures in aluminium. We then made and aluminium intake manifold for the new Yoshimura 28 carburettor”. The rear shock was also taken for a Ducati – a 900 SS in fact. Continuing the shape shifting, the bike’s seat has been reduced in height and length while also managing to keep the original appearance and has been recovered in premium Alcantara by a local saddlery. 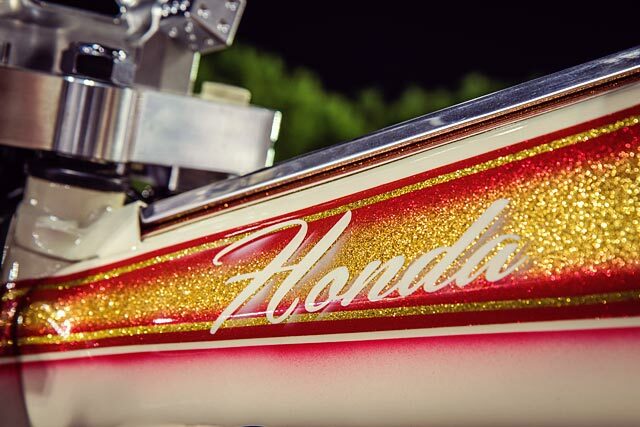 “Then I realised that a metal flake paint job would really take things to the next level, so I decided on a gold with some red airbrushed gradations on a base of cream to give it a cool, retro style. This was topped off with classic brush script lettering”. Other cool delights on the Honda include a host of Motogadget goodies, including a speedo and fob locker, some Falcon Vee Rubber tires, Enkei rims, a set of USV Racing forks and a Kepspeed exhaust system. 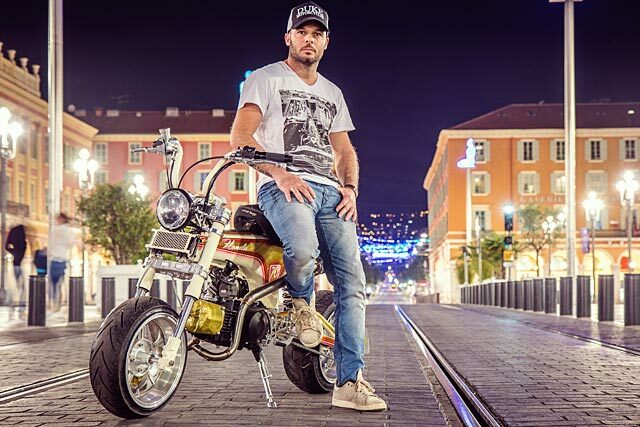 “For the Honda’s photos, we decided to do a night shoot in the centre of Nice,” says Lionel in closing. “I think the shots really show off the bike’s best parts. For me, that’s the rear end and the fact that it’s pure and finessed while also having a lot of physical presence. This was my core intention; this is the image I had in my head from the start”. Goal achieved, we think. And then some.